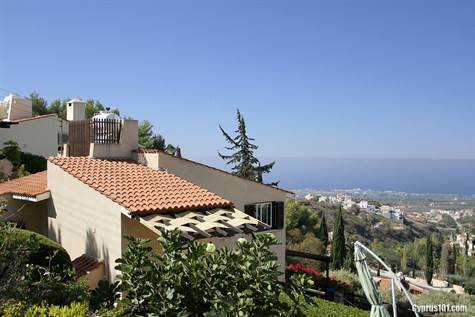 Kamares Villa, Paphos – This beautifully presented 3 bedroom detached villa with exceptional views is situated in a quiet residential cul-de-sac in the exclusive award winning resort of Kamares Village. The property is in excellent condition and has a wonderful ambiance with a mix of modern and character finishes, including wooden beamed ceiling, rich coloured terracotta tiling, feature fireplace with wood burning fire, decorative arches and much more. The kitchen with oak wood units has a half archway through to the living room and direct access to a spacious veranda – ideal for outdoor dining.